When shopping for a new smartphone, we tend to have our own ideas regarding what specific features and assets will lure us into making the purchase, and an interesting piece of research on smartphone buyers has shown that while, generally speaking, men and women look for the same kinds of features and functions, there are some notable differences. The survey, compiled by Nielsen, found that while, perhaps unsurprisingly, the male population sampled looked at things like processor speed, display size and operating system, female subjects were rather more considerate of finer details, such as contract terms and pricing. 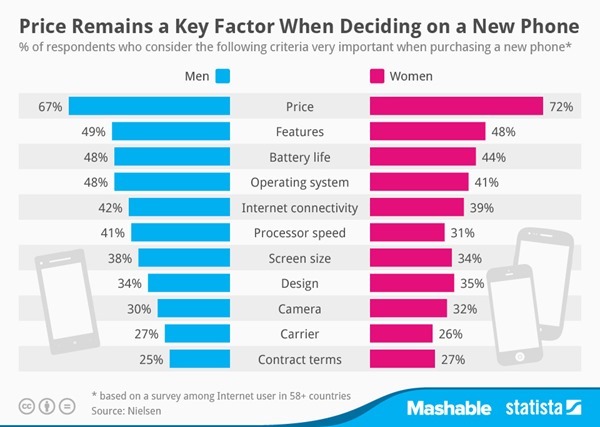 But even though, as cynical men and women would argue, it seems like the two genders are of different species at times, certain, staple features seem to unite smartphone purchasers of both the male and female variety. Battery life, for example, is a big deal, and although, as the Nielsen survey across more than 58 countries found, less than half of men and women considered battery performance to be essential, it was, behind price and features, still an important factor to assess when going out and buying a new smartphone. The fact that features – only by a slight margin – were of higher consideration than battery life, is telling of the times. Often, we’re so consumed by what a smartphone can offer us that we forget about the battery that needs to keep everything ticking over, and even though, with any new handset purchase, we spend that initial honeymoon period enjoying the great features packed therein, we normally pay the price for this immediate gratification with a waning, poor battery retention rate through the remainder of the contractual agreement. In other findings, it turns out that men and women are fairly united when it comes to the camera and carrier, although females seemingly pay more attention to the small-print of the contract. Despite what this research may tell us about men and women’s specific requirements when purchasing a smartphone, though, it’s clear that, for the most part, we all want the same things; a good runner that can hold its battery life, for a price that we can afford, and some of the latest and greatest features included. Everything else, it would seem, plays second fiddle, but do you agree? Be sure to leave your thoughts and comments below! One Tenth Of Men Would Reportedly Prefer Taking An iPad Over Getting Laid, Shocked?